Thanks for a great end of season. You will find the minutes to the AGM available for download for approval at next year’s AGM. We want to take a moment to thank those that attended, and to the 9 people who have volunteered to keep the ECRSA going in the upcoming year. It does take a fair amount of effort to run the league and these folks stepped up! Two positions went unfilled – Special Events Director, and Planning Coordinator. As well there were no volunteers for Treasurer before the AGM, so that also went unfilled by the previous commission. If you are interested in any of these three positions, please email your statement of interest to ecrsainfo@gmail.com (sooner rather than later). The following team awards were also given to individual team members. Congratulations to IT’S ALL NIC’S FAULT who rose up from 4th place this season to take the title! It’s that time of year! Time for the playoffs! 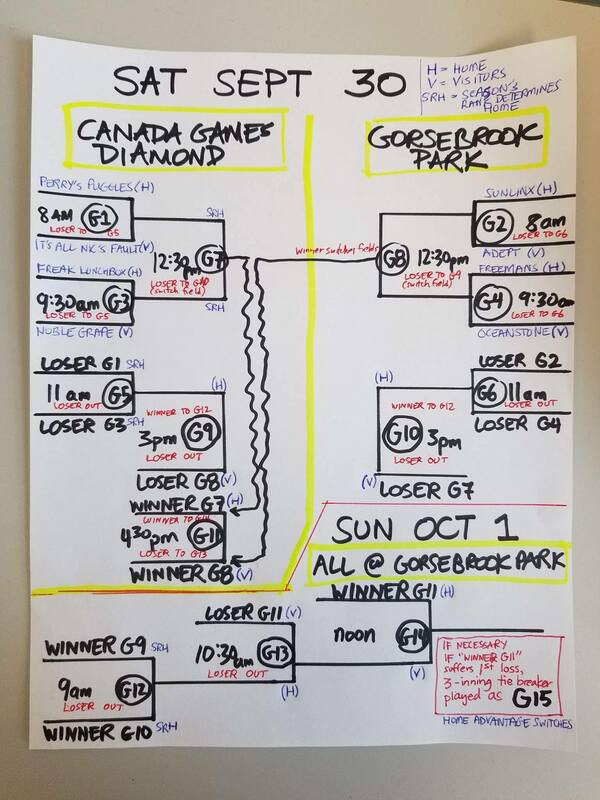 All games after these will follow the bracket shown above. Calling all ECRSA players and coaches! Ever want to be a part of the most fabulous parade in the Maritimes? Now is your chance. ECRSA has signed up to be part of the Halifax Pride Parade on Saturday, July 22nd. 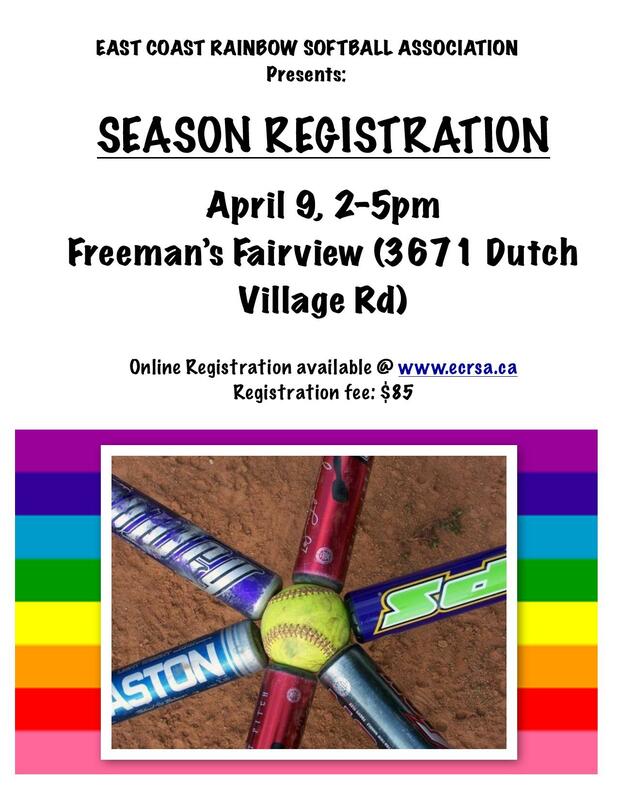 If you would like to don your team jersey and walk in the Pride Parade with us, email us at ecrsainfo@gmail.com. We will keep you in the loop for all the details leading up to and for the day of the parade. Let’s show our Ball Pride! July 28th – July 30th! The Mad Batter for May is now online. As well, the schedule is now updated for the season. An informal Meet & Greet/practice will be helped on April 23 from 1 to 3 PM at the fields on Connolly Street (weather permitting). This is a low key, non-mandatory way to get to meet some new and returning players. Please bring your glove and cleats (if you wish). There will be no Port-O-Potty onsite on this day, so pee before you get there. RETURNING PLAYERS: DO NOT wear your jersey as this is not a sanctioned event, but rather just a bunch of people getting together to have some fun. Stay tuned to the Facebook page and your email for updates. Registration for our 2017 season has begun! Want to join us this summer? We can accept payment via cash, cheque, money order, or PayPal. To ensure timely jersey arrival, ALL registration forms and fees must be received by APRIL 16, 2017.